From cedar totem poles to high-tech video installations, downtown Seattle sparkles with hundreds of artworks adorning plazas, lobbies, parks, and waterfront piers and paths. This impressive collection, comprising works by artists with regional or international reputations (and often both), has expanded rapidly as Seattle's urban core has grown. The explosive development of South Lake Union in recent years has brought major works by Jaume Plensa, Julie Speidel, Annie Han and Daniel Mihalyo, Buster Simpson, Jenny Heishman, and more. The Seattle Art Museum's ten-year-old Olympic Sculpture Park provides a breathtaking setting for Richard Serra's monumental Wake and Beverly Pepper's ever-changing Perre's Ventaglio III, and links the downtown waterfront to Myrtle Edwards Park, which features Michael Heizer's once-maligned and now beloved Adjacent, Against, Upon. Perfect for art and architecture lovers, as well as visitors and newcomers to the city, Art in Seattle's Public Spaces showcases the wealth of urban art to be freely enjoyed by all. 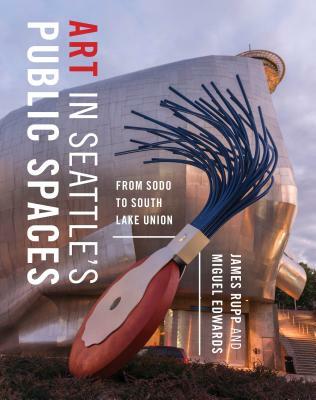 James M. Rupp is a Seattle native, long-time lawyer, and local historian who has been collecting information about art in Seattle's public places for over forty years. This is his second book on the subject. Sculptor Miguel Edwards has been a commercial and fine-art photographer in Seattle since 1992. His clients include Pacific Northwest municipalities and Fortune 500 companies, and his photographs have been included in numerous publications, including Billboard and City Arts magazines.